The Merriam-Webster dictionary defines a critic as: "one who expresses a reasoned opinion on any matter especially involving a judgment of its value, truth, righteousness, beauty, or technique." Follow along as we analyze a pair of GT6 coupes for sale on ebay. Here at the Daily Turismo we take pride in not just regurgitating the latest listings of a pre-ordained set of cars deemed "cool" by internet pundits and strive to express an opinion on the cars we feature. We are critics!! Hear us roar!! Unfortunately, the use of the word reasoned is often a stretch....anyway...today we bring two cars, similar in their condition and both bidding on ebay with a few days to go and we will dissect them with a freshly inked fountain pen in the categories of value, truth, righteousness, beauty and technique. 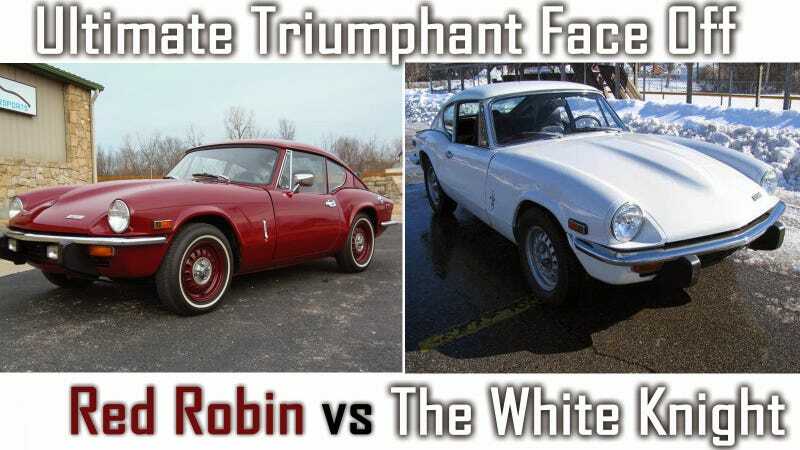 In one corner we have the a maroon 1971 Triumph GT6 Mk III currently bidding for $5,300 with 3 days to go in Peculiar, MO and in the other corner is a white 1972 Triumph GT6 Mk III currently bidding for $6,100 with Galion, OH with 5 days to go. Starting off with an easy category, lets look at the technique of each seller. Both seller's are using a run-of-the-mill private auction, but the white car has no reserve and a seller with the name Investments 2001, with an ebay description of Based in United States, investments2001 has been an eBay member since Oct 18, 2001. Sort of gives you the impression that this dude bought a bunch of old British cars in 2001 and is now trying to offload them for profit. The red car on the other hand has a reserve and is offered from a seller with zero recent feedback and registered on ebay literally last week. Yikes! Further internet sleuthing unearths that Desneux Motorsports was founded recently by Chris Desneux, has a brand new internet website and is located in Peculiar, MO — everybody has got to start somewhere right? The biggest difference in technique however, is the use of crappy 640 pixel wide images in the snow by Investments2001, while Desneuxmotorsports uses proper 1600-pix wide image. In an ebay add, good photos triumphs all other information and the prize for technique goes to the red robin. "what is that, or that's so cool."" This isn't like the time I had this thing on my neck and people were asking "what it that;" but I know an actual bona fide GT6 owner and enthusiast (not the Hack Mechanic, he hates the GT6 like it tried to eat his children) who says that his rusted hulk of a GT6 attracts crowds at his yearly pilgrimage to the Monterey Historics. He claims to have once almost run over a small dog due to the crowds of Japanese tourists following him around. Truth goes to the white knight. Beauty is easier quantify, but more difficult to judge when you have cars that are so similar. The maroon color of the red robin is so dark that combined with the liveresq shape of the GT6 it almost looks like something you pull from the guts of a turkey on thanksgiving morning before roasting it. White on the other hand...would look great with a racing strip, a few numbers or some "Fred's Towing and Bait Shop" decals, but as is it looks like a fleet car for a local city entity. You could stick a round City of Van Nuys decal on the side and never get another parking ticket in the Valley. Beauty goes to the red robin, because red is a color, white is base coat. and his maiden shall wear shoes suitable for pushing a stalled automobile. The prize for righteousness goes to the red robin for tidy spark plug wiring. Value is a very subjective term, but it could be considered a summation of all the previous points, and the red robin has so far beaten the white knight on 3 of 4 points. To add insult to injury the current bidding price on the white knight is also slightly higher (albeit, with fewer days remaining), but the red robin has an unknown reserve...and for this reason, the value award goes to the white knight. In conclusion, we have created a critical analysis of these two GT6's instead of our regular analysis that just criticizes. Final score; red robin 3 vs white knight 2. Originally posted as 10k: A Tale Of Two Triumphs: 1971 & 1972 Triumph GT6 on Daily Turismo.